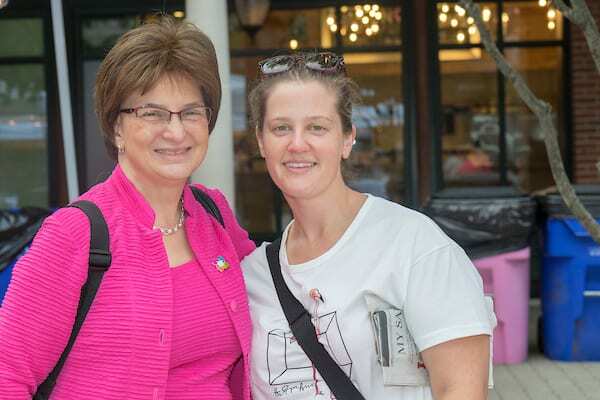 Dr. Patricia DeFusco (left) with Dr. April Duckworth at the recent Pink Party in West Hartford. Dr. Patricia DeFusco, affiliated with the Hartford Hospital Division of Medical Oncology since 1986, was recently named the first director of the Breast Program for the Hartford HealthCare Cancer Institute. Her experience – and an intrinsically pragmatic nature – will guide her as she works toward coordinating and standardizing the care provided to patients with breast health issues who seek care at any of the Cancer Institute sites. “We are already practicing at a very high level in concordance with the Memorial Sloan Kettering Standards of Care, but it is becoming increasingly important to establish metrics that enable us to measure the quality, efficiency and cost effectiveness of our care,” she says. 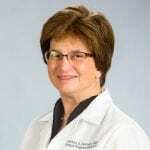 Having worked at Hartford Hospital for her entire career and part of both the integration of programs across the system into the Cancer Institute and the Memorial Sloan Kettering (MSK) alliance, Dr. DeFusco brings a wealth of knowledge about how the system currently works, as well as a vision for its future state. Establishing and coordinating a system-wide risk assessment and surveillance program by incorporating a standard template into the electronic record that will allow providers to utilize MSK surveillance guidelines and compare data. Developing extractable medical data to compare with populations at Memorial Sloan Kettering and other facilities. Developing breast teams that consist of surgeons, medical oncologists, radiation oncologists, pathologists, radiologists and a supportive network of nurse navigators, geneticists and psychological support within each HHC region. Expanding options for breast reconstruction within the Cancer Institute. Expanding outreach for underserved populations. Expanding services for patients undergoing treatment or in survivorship, including scalp cooling and programs addressing treatment-related sexual and psychosocial concerns. “My interest in serving as director of the Breast Program is a natural evolution of my position as lead of the Breast Disease Management Team,” she explains of the team created as the system began the journey toward becoming the charter member of the MSK Alliance to review how HHC was providing breast care by evaluating results against those from MSK. In addition, Dr. DeFusco says Cancer Institute Vice President Kristi Gafford and her predecessor, Donna Handley, have both been influential, imparting leadership skills and helping her assess opportunities and projects. Even in her new role, Dr. DeFusco will continue to see patients. She looks forward enthusiastically, remembering the reasons she became a physician in the first place and anticipating the growth of the HHC Breast Program. “Medicine is an art and a science; it is a profession, not a job,” she begins. “With each person you meet, you need to do your best to understand who that patient is, what they value, what are their goals, what are their concerns, what are there supports. To try to make that connection takes time, patience and compassion, but it can elevate an experience that is inherently terrifying. Click here for more information on the Hartford HealthCare Cancer Institute Breast Program.